In an art form awash with ingenues and shiny singers newly minted from music school, Ellen Robinson’s emergence is a breath of fresh air. With her new album Don’t Wait Too Long, the Oakland jazz vocalist makes a convincing case for the value of life experience as a template for reimagining American Songbook standards and more contemporary fare. Displaying impressive skills as a songwriter, she also infuses hard-won wisdom in original tunes. Like her two previous releases, Don’t Wait Too Long was produced by the sure hand of drummer and veteran DJ Bud Spangler. It’s the work of a late-blooming artist with a clear, heartfelt vision, exquisite taste, and lovely voice that lingers in your ear long after the music has finished. The album opens with “Dance Only With Me,” a rarely sung gem by Jule Styne, Betty Comden and Adolph Greene from the 1958 Broadway comedy “Say, Darling” about the making of a Broadway musical. She turns the song into a wistful reverie, far more a whispered prayer than an imperious demand. 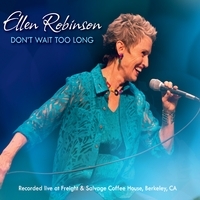 Even when Ellen interprets familiar material, like Lerner and Loew’s standard “Almost Like Being in Love,” or Johnny Burke and Jimmy Van Heusen’s “But Beautiful,” she unveils new shades of meaning in the lyrics, letting the tunes unfold at deliciously languorous tempos. When Ellen takes liberties with a song, like her slyly re-harmonized version of Irving Berlin’s “Be Careful It’s My Heart,” she doesn’t so much reinvent it as highlight the tune’s playfully imploring lyric. She transforms songs of more recent vintage too, like her jazz appropriation of the mid-60s pop hit “Our Day Will Come” which she delivers with righteous conviction.